Forex trading fulltime can be used as a vehicle to replace current income from fulltime work. 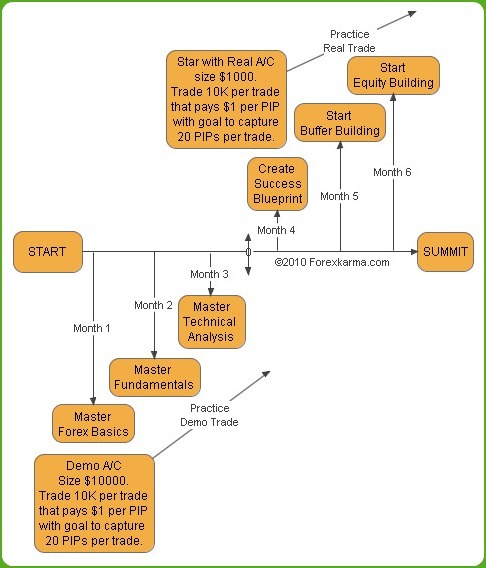 However if you are making 6-7+ figures earning, then it might take a while unless you start out with much larger principal investment, which I do not recommend it, not at least for the first 6 months to a year of forex trading experience. Replacing current income should be planned as a long term goal. Set aside 2-3 years after 6 months of trading exposure if you are trading full time as outlined in the timeline below. There is no substitute but to master the basics of forex fundamentals and technical analysis for the first three months. Next, the first goal must be buffer building. The second goal must be equity building and the third goal should be to replace current income from fulltime work. ONLY and Only after traders successfully accomplish the first two goals should traders attempt to replace current income from forex trading fulltime. Allow yourself minimum of 6 months of exposure to forex trading before you attempt this mighty feat to replace current income from forex trading fulltime. Let set our forex trading goal right now and see what challenges we might have to overcome before we can actually begin as a fulltime trader. For illustration purpose, I will consider my goal to withdraw $5000 per month consistently so I can replace my current 8-5 day time JOB (=Just Over Broke). I will set my goal to withdraw $5000 per month. What's your goal? Set it now. In order to comfortably withdraw $5000 per month from forex trading fulltime, I will actually have to make more than just $5000. $5000 is the minimum requirement amount that I will need to make per month basis to pay my bills. But to be sure I can comfortably withdraw that minimum requirement without any damage to my trading account, I will set my monthly goal a little bit higher, say $10,000. Remember from my equity building plan, we only risk on our buffer amount and not on initial principal investment or seed money. 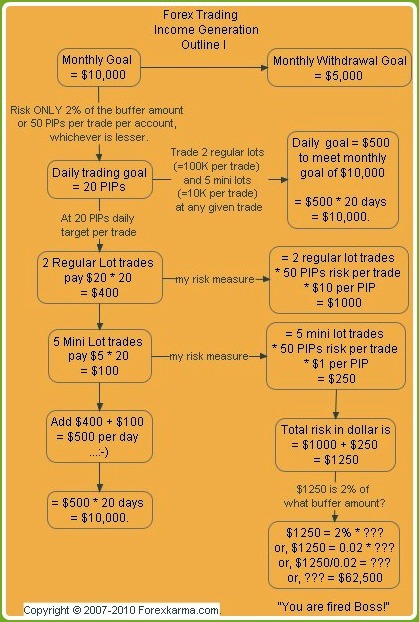 Risk only 2% of the buffer amount or 50 PIPs per trade per account, whichever is lesser. The maximum risk exposure per account per trade should not exceed 5% of the buffer amount at any given time at any circumstances. In the event of losing all my buffer amount, I will again start with buffer building phase. These strict risk measures are enforced at all times to assure that I can continue my forex trading fulltime without any interruptions in case of any drawdowns. At the rate of 20 PIPs per day per trade, I will have to make $500 per day to meet my monthly goal of $10,000, i.e. So in order to make $500 per day on 20 PIPs per trade basis, I will have to trade 2 regular lots (=100K per trade) and 5 mini lots (=10K per trade) at any given trade. One can always use various combination but for the simplicity purpose I will stick with 2 Regular lots and 5 mini lots. = $10,000.00 in a month. Is Your Head Spinning With This Math? Got Question...??? The big question is with risking only 50 PIPs or 2% of the buffer amount whichever is lesser, how much equity do I really need to build up? And how long will it take me to achieve this goal? So, in order to make $500 per day on 20 PIPs per trade basis, I will have to trade 2 regular lots (=100K per trade) and 5 mini lots (=10K per trade) at any given trade. $1250 = 2% x ??? or, $1250 = 0.02 x ?? ?